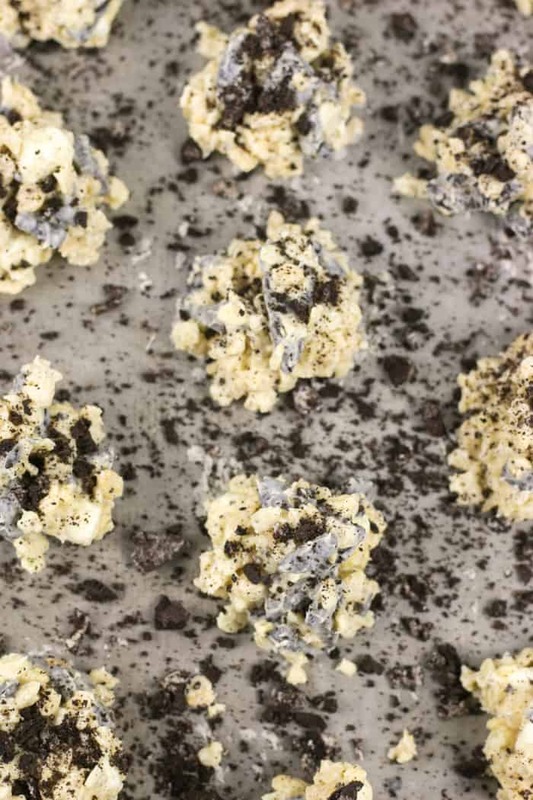 No-Bake Cookies and Cream Avalanche Cookies are a dream for cookie-lovers! 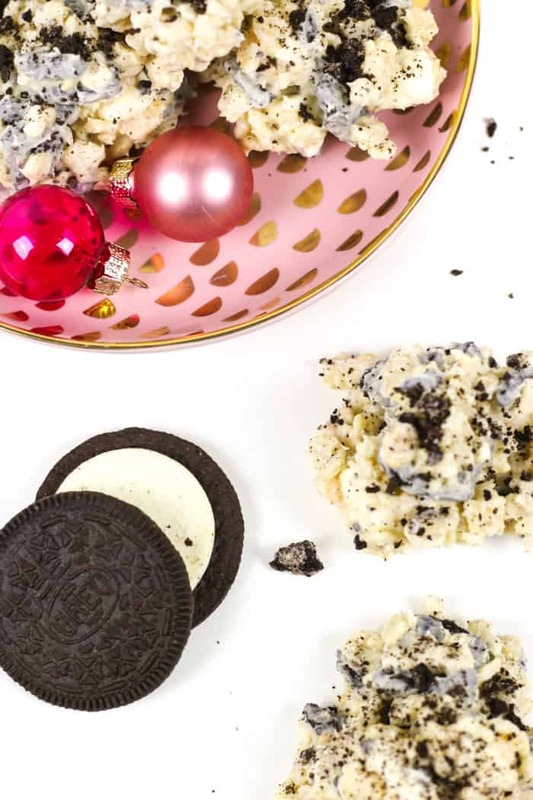 Melted white chocolate coats crispy rice cereal, marshmallows and chunks of Oreo cookies for a crunchy, black-and-white treat. 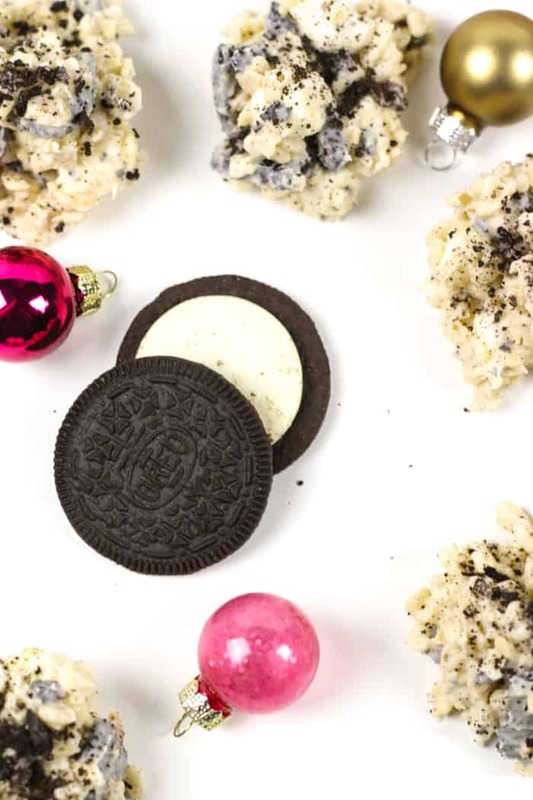 They’re great for holiday cookie swaps! Cookie swap parties are one of my favorite parts of the holidays. I mean, how great is it to hang out with friends and get a sugar rush from all the cookies ever? You really don’t need a better reason to have a party, in my opinion. Cookies are simply the best. I love making cookies of any kind (I have a whole archive of cookie recipes). Every Christmas season of my life, I’ve definitely spent a day or two baking. It’s one of my favorite traditions. Most years I make time to spend an evening with my dad helping him bake trays of cookies for his neighbors and an afternoon decorating sugar cookie cutouts with my mom and siblings. But as I get older, I appreciate more and more the need for quick and easy cookie recipes. There are some intense cookie recipes out there. 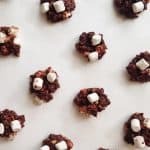 My to-do list is always two miles long in December (instead of just one), which is why I love to make no-bake cookies sometimes, like these Salted Honey Cereal Bars or these No-Bake S’mores Cookies. 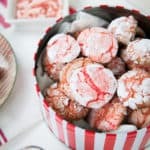 They’re still tasty and made with love, but they’re much easier to whip out in under an hour than many baked cookie recipes. 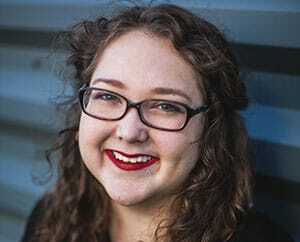 I started blogging just about four whole years ago (OMG). Sometime in my first year, I met my friend Erin from The Speckled Palate who invited me to participate in her big, virtual Christmas cookie party, The Sweetest Season Cookie Exchange. Every year since, I’ve shared a recipe I love to make at the holidays. 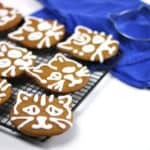 Last year I made Cardamom Ginger Cat Gingerbread Cookies (with a special appearance from my mom’s cute kitty). The year before I made these spicy Mexican Chocolate Chocolate Chip Cookies. 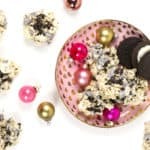 But my biggest blog cookie success in the last four year has definitely been The Sweetest Season recipe from my first year of blogging: Avalanche Cookies. 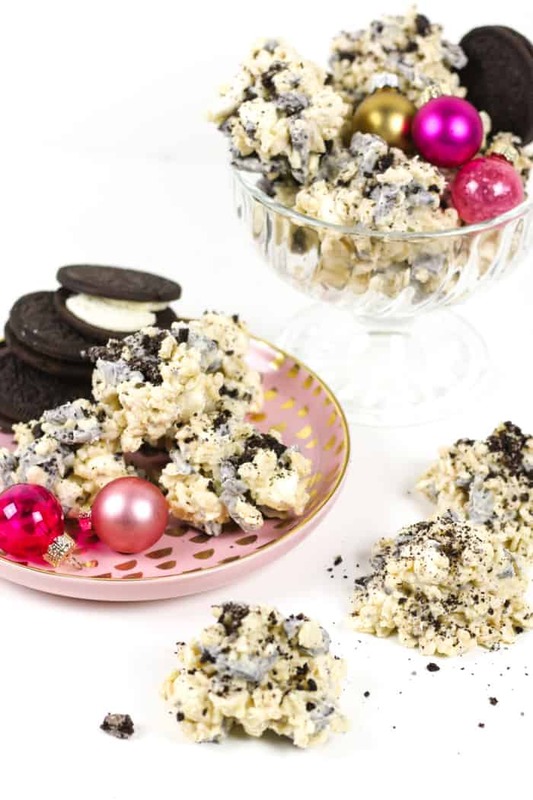 I made these Cookies and Cream Avalanche Cookies for my contribution this year as an homage to that first year. That recipe is one of my most popular recipes this time of year, along with the Yule Mule and Champagne Jell-O Shots. 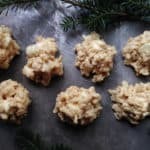 My original Avalanche Cookies feature rice crispy cereal and marshmallows enrobed in a mixture of creamy white chocolate and peanut butter to create snowball-esque cookies. They are always a hit at cookie parties! For the cookies and cream redux, I held the peanut butter and added chunks of Oreo cookies and topped them with cookie crumbs. This year, The Sweetest Season raising money for our friends at Cookies For Kids’ Cancer — you can donate here. This non-profit is dedicated to funding research for new, innovative and less-toxic treatments for childhood cancer, which is the #1 cause of death by disease of children in the U.S. Since 2008, Cookies for Kids’ Cancer has raised money for 100 research grants to pediatric cancer centers across the country. Their hard work has paid off — these 100 grants have stemmed 37 treatments available to kids battling cancer today. Founded by parents who lost their son to childhood cancer, it all started with a giant bake sale (of 96,000 cookies!) to raise money for this cause, which is why CFKC is such a good fit for The Sweetest Season. If you need a good end-of-year cause to donate to, Cookies For Kids Cancer would be a great one. Don’t forget to donate here. 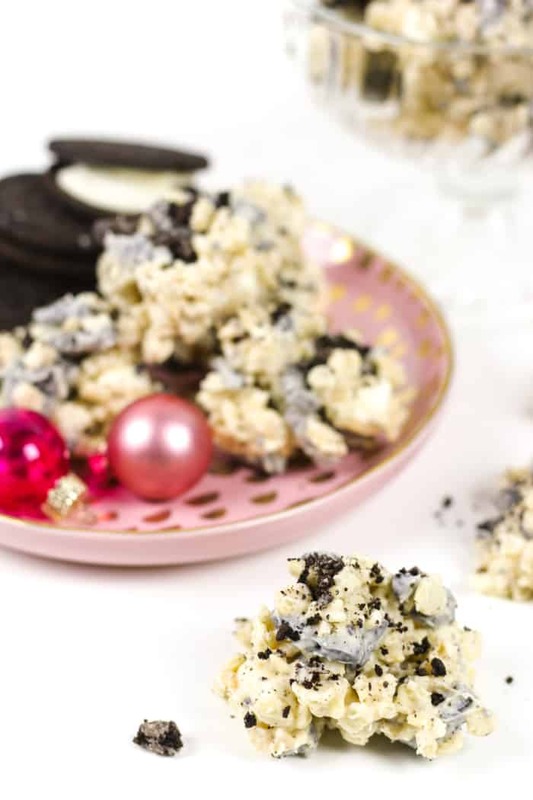 So if you need to bake plates of cookies for a cookie swap party, for friends and neighbors or even just for Santa, save a lot of time with these no-bake Cookies and Cream Avalanche Cookies. Everyone will love them, and you get a few extra minutes for allllll the other things on your list! 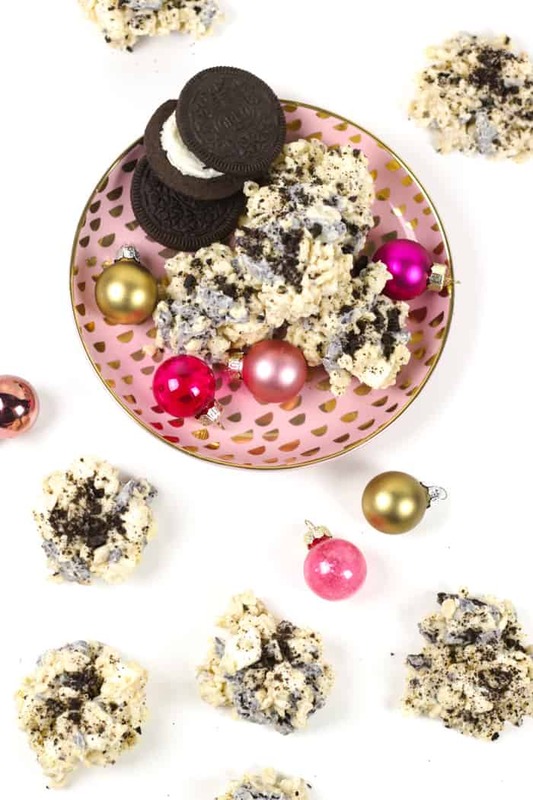 No-Bake Cookies and Cream Avalanche Cookies are an easy holiday cookie. Coat crispy rice cereal, marshmallows and Oreo chunks with creamy white chocolate. Line a baking sheet with wax paper. Set aside. 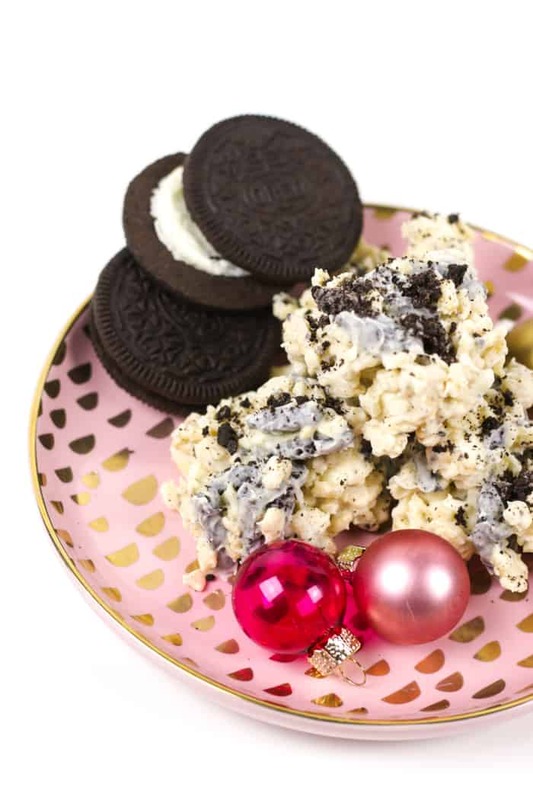 Cut or break Oreo Cookies into large chunks. Set aside. Gather smaller crumbs into a bowl for garnishing the cookies. In a large bowl, stir together cookie chunks, cereal, marshmallows and salt. Set aside. In a glass, heat-safe bowl, melt the microwave white chocolate chips for 20 seconds on 50% heat. Stir. Repeat until white chocolate is completely melted and smooth. Be careful not to overheat. Pour white chocolate over the cookies, cereal and marshmallows. Stir until the white chocolate completely coats the cereal mixture. Spoon heaping tablespoons of the mixture onto the baking sheet. Allow to cool and harden, about an hour. For faster set-up time, place baking sheet in the fridge for half an hour. Everything about these cookies sounds amaaaaazing! No bake? Cookies and cream? Avalanche? If there’s a dessert and avalanche is in the title, you know I’m in! Thank you so much! They are super delicious. I hope you like them! Thanks for the comment, Julie! Cookies and cream anything is perfect in my book. These sound so delicious! Thank you! The combo of cookies and cream is always a good idea to me too. 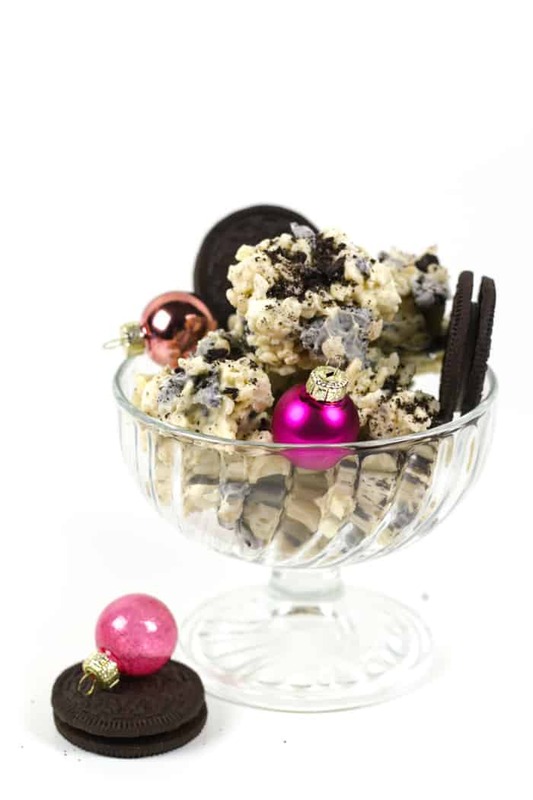 I love everything about this recipe – cookies, dessert, no bake, avalanche, cookies & cream flavor, and a good cause to donate to. Can’t wait to try this! Oh, and I adore the pretty pink and gold dish you used too.